[NEW YORK, NY – June 26, 2017] – Claiming the No. 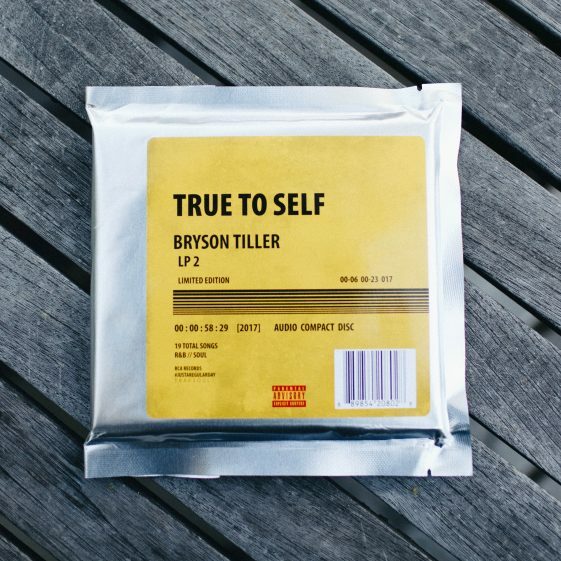 1 spot on the Billboard 200 chart upon its surprise release last month, BRYSON TILLER’s True to Self is now available physically in stores via Trapsoul/RCA Records. The album contains four special unseen photos, which have been transformed into functioning photo slides with captions from Bryson. Accompanied by a booklet of personal photos shot exclusively by Bryson’s photographer Ro.lexx, the physical release gives fans an inside look into the album, further epitomizing the aptly-named title, True to Self. Bryson previews the album’s physical format in an exclusive unveiling video, which can be viewed and downloaded here. Bryson most recently stopped by Apple Music’s Beats 1 Radio for an interview with Zane Lowe, giving his first in-depth commentary on the album since its release. The nearly 30-minute long conversation details True to Self’s creative inspiration and touches on everything from the singer’s artistic insecurities to the relationship with his grandmother and even Nintendo 64. You can listen to the interview on Apple Music here. The Grammy-nominated singer will bring his new album to fans on his upcoming “Set It Off Tour,” which will kick off this August in Atlanta and make over 25 stops before concluding for a hometown finale at Louisville’s KFC Yum! Center. Taking the Staples Center stage at this weekend’s BET Experience, Bryson Tiller announced a new Los Angeles stop on his upcoming “Set It Off Tour.” Bryson will bring his latest album True to Self as well as favorites from 2015’s T R A P S O U L to the historic Greek Theatre on August 14th. The new date is part of his second headlining tour, which will feature special guest openers H.E.R. and Metro Boomin, and is the first round of new dates since his hugely successful “T R A P S O U L Tour,” which sold out 47 dates in both the US and Europe, including two back-to-back shows at Radio City Music Hall. Presale tickets for The Greek Theatre show can be purchased beginning Wednesday, June 28, and general tickets will be available to the public on Friday, June 30 at 10am local via http://www.trapsoul.com and http://www.AEGPresents.com. Tickets for all other dates are available now via http://www.trapsoul.com and http://www.AEGPresents.com. *All dates and venues subject to change. All dates feature special guests H.E.R. and Metro Boomin unless otherwise noted. Newly-announced Greek Theatre date bolded below. True to Self marks the singer’s first No. 1 debut in the US, also claiming the top spots on the Top R&B/Hip Hop Albums, R&B Albums and Digital Albums charts and garnering 107,000 equivalent album units in its first week, according to Nielsen Music. Proclaimed by Variety as, “one of the biggest records of the summer, if not the year,” True to Self has been streamed more than 400 million times worldwide, with its lead single “Somethin Tells Me” amassing 36 million streams worldwide since its May 11th release. Tiller’s debut album T R A P S O U L also reached significant milestones, including RIAA Platinum certification with over 2.1 billion streams in the U.S. Album tracks “Don’t” and “Exchange” are certified Triple Platinum, “Sorry Not Sorry” is certified Platinum and “Rambo” and “Overtime” are certified Gold by the RIAA. Among his many accomplishments, Tiller was nominated for a GRAMMY (Best R&B Song for “Exchange”), won two BET Awards for Best New Artist and Best Male R&B/Pop Artist and has sold-out 47 shows on his “T R A P S O U L Tour” in both the U.S. and Europe. Bryson will return to the stage once again for his forthcoming “Set It Off Tour,” where he will perform fan favorites from both T R A P S O U L and True to Self.